Wherever the geographic origin the surfer, nomadic in nature, suddenly finds the urge to travel – seeking not only new waves, but simply new horizons. Gypsy nature. The question of where to go at what time of year is always lingering on the traveling minstrels mind. In some instances the tents are drawn and the trek is on regardless of weather and wind. In others, the seasoned traveler carefully plots a course and narrow focuses on the best-case scenario to find great waves. When it comes to swell reports and wind conditions, all certainly wish for a crystal ball. 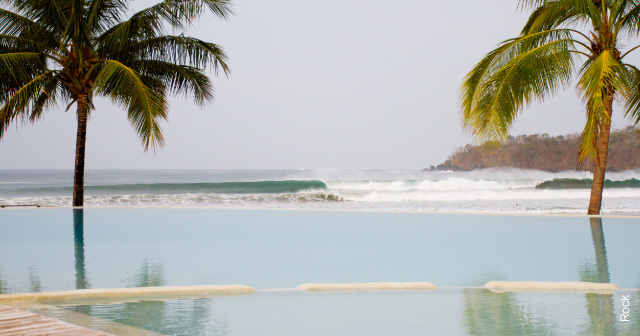 For the second year in a row Freesurf Magazine would pick Panama as the destination of choice for a late spring gypsy fling. Based on previous experience, Panama is a prime location for a serious surfing fix and simply a great place on the planet to be… The crystal ball may not be a guarantee, but consistent south swells and dominant offshore winds equal promise of small fortune for any surfer. Surrounded by the Caribbean and the Pacific Oceans, Panama features a stunning array of coastline complete with point breaks, beach breaks, mixed reefs and roping sandbars. The country offers comfortable amenities, decent roads and a fabulous culture. There’s something for all walks of life in Panama. From extravagant nightlife and business in the city to remote jungles with no one in sight. A multi-nationally rich country, Panama has been influenced by Europe, Asia and the Americas ever since the construction of the Panama Canal, which connects the Atlantic Ocean via the Caribbean to the Pacific Ocean. A key channel for international maritime trade and a conduit to mixing world cultures. This year the gypsy crew would once again include Venezuelan born Panamanian resident Magnum Martinez as one of our guides and top surfer of the region. Sunny Garcia who was recently in Ecuador for the Masters Championship would also come to brandishing his power stamp, along with two hot young , Hawaiian hotdoggers, Keanu Asing and Kiron Jabour. Top womens surfer and former ASP World number 2 Rochelle Ballard would also make the trek… And myself. Once a wanderer, always up for chasing waves. The trip would start in Panama City with a very comfortable day or two at the Radisson Hotel. The crew ventured out to a local point break known as Rincon. The waves were small and inconsistent, and wind was slightly onshore. Luckily for the rest of the crew, the two youngest wouldn’t take no for an answer. They had to try their new boards and get wet in this seemingly closed out crumbly break regardless. Within twenty minutes the tide started moving in, the wind switched and blew offshore and what was miserable only a half hour earlier looked super fun, 3 foot and rippable. Our first session was by no means groundbreaking, but it was fun scenery and we all are very happy to get wet. One thing every surf traveler should know about Panama is you’re going to put in some road time. There are so many different nooks and crannies on the Panamanian coast that are worth exploring. While the roadways are relatively good, unfortunately they don’t all hug the coastline. So typically inland travel is necessary to reach different parts of the coast. We decided to base our production at the extremely comfortable Playa Venao Hotel Resort. Directly in front of the resort is a world-class beach break where on its worst day it’s still a fun place to just play around and practice your tricks. Relatively nearby are several different point breaks, reef breaks and beach breaks and if you drive about an hour on the coast you’ll find a whole new set of a dozen more breaks. These nearby spots include some incredible slabs, another point break and all kinds of untapped beach breaks. The view from Playa Venao hotel resort. There was plenty of swells on the map and although the wind wasn’t perfect, every day was an absolute score. At one particularly secret beach the crew would enjoy standup barrels while the tide and wind cooperated for a few hours. This little barrel session would prove to be our best day of surfing in the first week not because the swell wasn’t there, but because we chased different tides in different winds and it was a challenge. The crew scored great waves and fun surfing conditions on almost every single day of the week, but the intense barrel session we experienced on that first day at secret beach set the bar high. Luckily we had a beautiful location to come home to every day and each of the athletes enjoyed fantastic Panamanian food service and beautiful sunsets and scenery. The crew also had a chance to go fishing. Lucky for them they know how to catch waves because the only thing they caught was an old T-shirt. The area is well known for great fishing, but somehow our hooks were eluded for the day. On day six of our venture at Playa Venao a new swell rolled in, the wind turned stiff offshore and the beach break turned on incredibly. The water texture was a beautiful small grained offshore with corduroy lines to the horizon on the sets. While some of the waves were too fast and walled up at lower tide, the medium tide brought insane five-second barrels as well as long smooth walls for great carving. fter one last sumptuous meal at Playa Venao Resort Hotel we got together with our guides, Richy Arosemena and Magnum Martinez. Both of them suggested we drive 4 to 5 hours to a new location. With a dropping swell and a slight shift in the wind they expected some great barrels at a beach break we’ll call “West Az”. After another long road trip and 14,713 potholes we arrived in “West Az” and were greeted with offshore winds, 4 to 5 foot spitting barrels making us a very happy group of Hawaiians. After nearly 7 days of super fun beach breaks, point breaks and exploration, the crew would enjoy the best barrels of the trip. The gypsy happy dance involved air drops, spitting tubes and ONLY our group on a two-mile stretch of beach! And to satiate our gypsy spirits we treated ourselves to a horseback ride up river for a cool clear fresh water dip. Perhaps a successful surf trip is measured only by its waves, but to this crew the outcome was marked by different standards. Scoring good surf was of course the driving force behind our wanderlust, but the culture, adventure and beauty of Panama is what remains embedded. A colorful country to explore, the exotic landscape is all a band of nomads could hope for. 6 gypsies, 2 wagons, over 25 surfboards, 12 days and success. Panamania!